The overwhelming presence of the emotions both in science and contemporary social life begs for an explanation from the point of view of the same social theory. 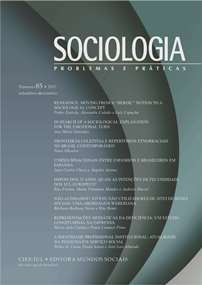 Even though the works of Hochschild, Scheff or Illouz contain indications that allow for a theoretical link between the contributions of the sociology of emotions and the theories of late modernity advanced by contemporary social theorists, this link has not yet been explicitly developed in the literature. The purpose of this article is to call attention on this link by highlighting the role of emotions as sites of social reflexivity. Associate Professor of Moral Philosophy in the Department of Philosophy at the University of Navarra (Spain) and Researcher of the Institute for Culture and Society at the same institution. Director of the “Emotional Culture and Identity” Project, at the Institute for Culture and Society.